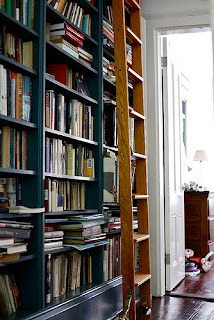 Clean Slate Confessions: Book Clutter? A family I have been working with has a very large book collection... very large, people! We have spent quite a few days working on sorting through their books, organizing them by categories, and then finishing up by putting them in chronological order. It's been a fun project and my arm muscles are getting a workout from carrying all those books! I used to keep all my books, but recently I have decided to donate most of them. I just didn't want any "book clutter" and I would rather use my shelf space for other things. It has been interesting to see how important books are in some households and how much space is dedicated to them. Do you have a large book collection? Did you keep all your books from school? If so, why did you keep them? Do you find yourself looking at the books again and even reading them? Would you ever consider books as clutter?